Chef Chris Montero of Bacco in New Orleans, Louisiana shares his recipes for Panko Crusted Boudin and Seared Scallop with Wheat Beer Mustard and Louisiana Popcorn Rice Cakes, Bulgogi Wagu Hanger Steak with Kim Chee and Herbed Polenta Cake, and Louisiana Berry Semifredo Crisp from a Spirited Dinner that paired cocktails created by Bar Chefs Debra C. Argen and Edward F. Nesta aka The Spirited Travelers of Luxury Experience Company with each of his courses as part of the Tales of the Cocktail 2009 celebration. 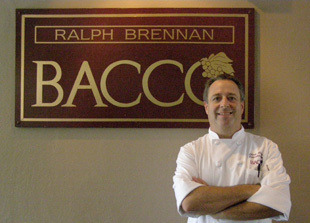 Edward Nesta and I had the pleasure of working with Executive Chef Chris Montero on a Spirited Dinner on July 9, 2009 at the widely acclaimed Ralph Brennan restaurant, Bacco, located in the French Quarter. The Spirited Dinners take place once per year during Tales of the Cocktail and pair local restaurants with guest Bar Chefs, who work together to create an evening of culinary and cocktail pairing. After months of planning the menu and perfecting our complementing recipes, it was great to finally meet Chef Chris and learn more about this native of New Orleans. Although Chef Chris Montero had a passion for cooking as a child, and comes from a family of good cooks, he majored in journalism in college. During college, he worked as a bartender, and upon graduation he started working in the top restaurants as a bartender, and maitre d', before he drifted into the kitchen, and found that this was where he wanted to be, and worked every position in the kitchen. 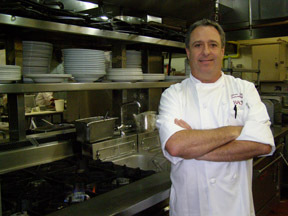 He honed his career working at the Louis XVI restaurant in the French Quarter working under Daniel Bonnet where he learned about European style and French cuisine, and also worked with esteemed chefs Susan Spicer and Warren LeRuth before joining Bacco in 1999. Working as he did, learning all components of the restaurant business affords him with the unique insight into both the front of the house and the back of the house operations, which is important in his position as Executive Chef, and stated that although this business is rarely glamorous, has long hours, and is hard work, at the end of the day, it is a wonderful experience. Chef Chris described New Orleans as a city that has always been a restaurant city, and is one of the most European cities in the world. 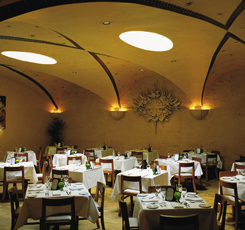 The city has a long tradition of families working in the culinary profession generation after generation and learning the business from the ground up. He is a lifetime New Orleans Saints season ticket holder and enjoys watching his team play, is an avid distance runner, and first and foremost, he and his wife, who was also a chef, are real foodies. Chef Chris Montero shares a taste of the Spirited Dinner at Bacco with his recipes for Panko Crusted Boudin and Seared Scallop with Wheat Beer Mustard and Louisiana Popcorn Rice Cakes; Bulgogi Wagu Hanger Steak with Kim Chee and Herbed Polenta Cake; and Louisiana Berry Semifreddo Crisp. Method: Mix the dry ingredients together. Mix water and oil together and pour into the dry ingredients while stirring. Bring together and wrap dough in plastic wrap and let rest for 20 minutes or overnight. Cut dough in half. Dust work surface with flour and roll out one half of the dough. Roll as thinly as possible. Place on a sheet pan, brush with butter, and dust with kosher salt. Repeat with remaining dough on second sheet pan. Bake at 350° F (180° C) for 12-15 minutes. Remove from oven, let cool, and set aside. Method: Combine all ingredients. Cook over a double boiler stirring constantly until correct thickness is achieved. Method: To make the Boudin cake, mold into shape that is similar to the scallop. Then press the flat sides of the cake into panko crumbs, and crust the top and bottom of the cake. To prepare the scallop for searing, heat a non-stick sauté pan to near smoking point. Pat dry the scallop with a towel, and season it with salt and pepper. The sauté pan is ready when you add the oil and it begins to slightly smoke. Sear the top and bottom of the scallop until a golden brown crust forms, about 1 minute on each side. To sear the Boudin cake, brown both the top and bottom of the cake in the same hot sauté pan until a crust has formed and the cake is heated all the way through. 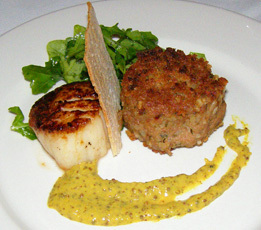 Presentation: Arrange the Boudin cake and seared scallop with the beer mustard on a plate. Dress the arugula with extra virgin olive oil, salt, and pepper, and add to the plate. Finish with a broken piece of popcorn rice cracker. Method: Combine all ingredients and marinate hanger steak at least 2 hours and up to 24 hours. Method: In a pot, combine cream and stock and bring to a boil. Slowly add the polenta while stirring constantly for 8 minutes. Stir in all remaining ingredients. Evenly spread a 1-inch layer of hot herbed polenta on a sheet pan and place in refrigerator until firm. Cut into shapes using a ring mold, and keep cold until ready to plate. Method for the beef: Over hot charcoal, fire sear the hanger steak for 4 - 5 minutes on each side for recommended medium rare. Allow steak to rest for 4-5 minutes before slicing, being careful to cut steak across the grain. 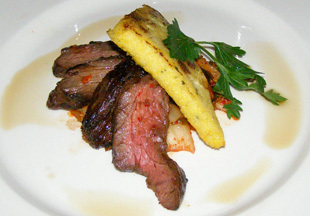 Presentation: Fan slices of beef around grilled polenta cake and cool and spicy Kim Chee. Method: In a small heavy saucepot, combine berries and sugar and bring to a simmer. Let cool and reserve. Method: Place all dry ingredients in a mixer and combine thoroughly with paddle attachment. Cut cold butter into small cubes and add to dry ingredients and mix until it looks like coarse meal. Bake on a greased baking sheet at 350° F (180° C) until golden brown. Method: Whip cream with sugar and vanilla until soft peaks form. Beat egg whites to soft peaks and fold into cream along with the rum. 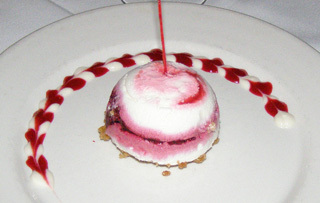 Presentation: Break baked crisp into small pieces and gently fold into the semifredo alternately with cooked berries. Serve with Luxury Experience's Rhythm and Blues Cocktail. 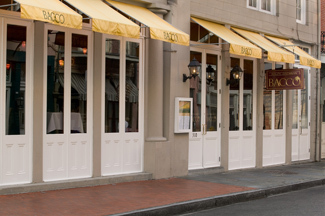 Bacco's restaurant focus is a fusion of Creole and Italian cuisine, and is open for lunch daily from 11:30 am until 2:30 pm, and for dinner Sunday through Thursday from 6:00 pm until 9:30 pm, and on Friday and Saturday from 6:00 pm until 10:00 pm. Read about Bacco in the Restaurants section, and also in the Liquor Cabinet for the Cocktail Recipes from the Spirited Dinner at Bacco. Read about Tales of the Cocktail in the Liquor Cabinet section. For more information on the next Tales of the Cocktail, please visit the website: www.TalesOfTheCocktail.com. For information on New Orleans, please visit the New Orleans Metropolitan Convention & Visitors Bureau, Inc. website: www.NewOrleansCVB.com. © November 2009. Luxury Experience. www.LuxuryExperience.com. All rights reserved.